Student’s father creates bronze deer in memory of his son. Louise Sidley, left, and David Sidley speak to family and friends gathered after the sculpture “Pair of Deer” was officially unveiled at UBC’s Okanagan campus. Two bronze deer now grace the grounds of UBC’s Okanagan campus, a gift that will forever stand as a legacy to former undergraduate student River Sidley. River died suddenly in 2014 and received a posthumous Bachelor of Science degree in June 2015. The artwork, “Pair of Deer” was created by River’s father David, a sculptor from Rossland, BC. The family, grateful for the experience their son had at the university, donated the bronze sculptures as a way of commemorating River’s memory. The bronzes, which were conceived in Rossland at the artist’s studio and then cast in Kelowna, were installed in the campus courtyard in time for June’s convocation celebrations. “His important work adds breadth to our collection and resonates well with existing outdoor artworks on campus,” says Susan Belton, curator of UBC Okanagan’s Public Art Collection. River was studying at the Bamfield Marine Science Centre at the time of his passing, leading the Sidley family to endow the River Timothy Sidley Memorial Award in 2015. The award supports a UBC Okanagan student who shares River’s love for marine biology and who is pursuing additional studies at the Bamfield Marine Science Centre. River’s mother Louise, who received her Masters of Fine Arts from UBC in 2010, says her son had found his life passion at Bamfield and through the award in River’s name the family wishes to honour his life. The family ties with UBC are deep and the Sidleys were filled with pride when River’s sister Sage graduated from UBC Okanagan campus in 2016 with a Bachelor of Fine Arts. 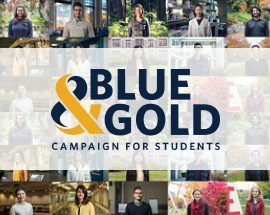 The family is now in the process of establishing a second award at UBC Vancouver to further honour their son’s memory and support even more UBC students. “I think our relationship with UBC has helped our whole family deal with our loss because of the legacy we’re able to leave behind,” Louise adds. The deer were installed into the university’s courtyard, a spot where students and faculty gather for occasions throughout the year. The artwork was officially unveiled on June 16.